Join us for a 9 am kayak tour – this is a great time of day for Kayaking! You’ll be dropped back into town by 12:15 pm –and can check in with the Helicopter Line for their last tour of the day at 1:30 pm, returning to town by 5:30 pm. A first-hand exploration of a glacier by chopper and foot is an experience you will never forget. 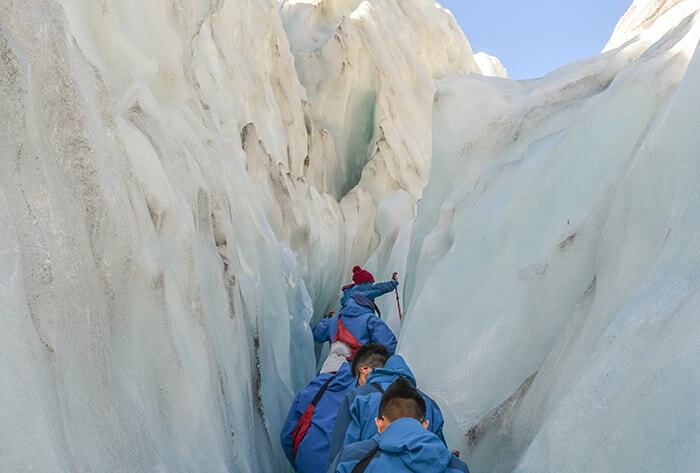 From the Helicopter Line Base, you’ll fly up to the Franz Josef Glacier in the Westland National Park. You’ll land on a section of this 12km long glacier where the guides have made a daily safety assessment of the conditions on this fast-moving ice flow. 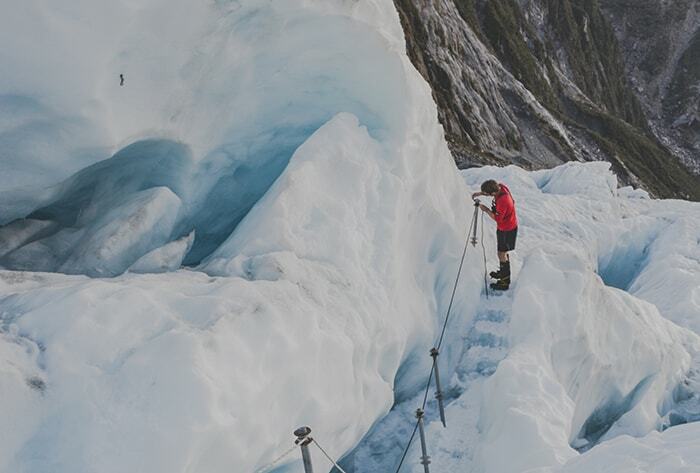 Equipped with glacier boots and crampons you’ll walk for two hours amongst the ice formations, pinnacles and seracs and see first-hand the extraordinary colours of the ice-flow. Touch the ice, breathe in the fresh air. Children must be 8 years or older for the Heli-hike. 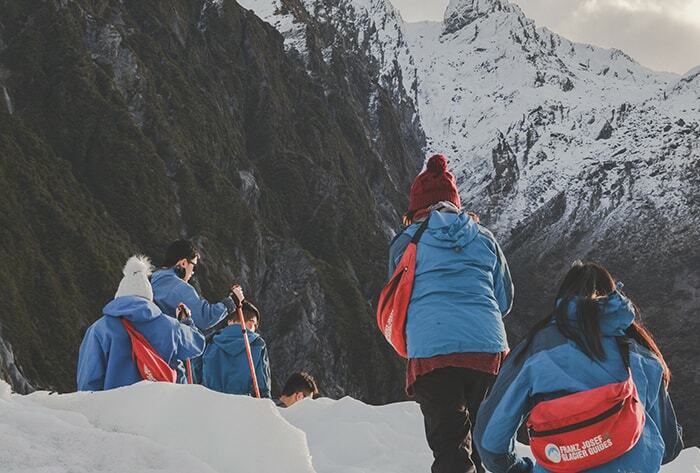 Experience the snow fields and glaciers from a distance. Glide effortlessly across the water taking in the panoramic views of the Southern Alps, glaciers, and untouched Jurassic rain- forest reflected on the glassy waters of Lake Mapourika. Paddle into the heart of the Okarito Kiwi Sanctuary, exploring the protected area with your knowledgeable guide. Entry to the Glacier Hot Pools is included with this package if you book with us! Enjoy a nice relaxing soak after you’ve completed your combo. Waterproof jacket (provided if you don’t have one). After doing this trip on 22 Oct, I understood why it is rated so highly. Me, my wife and 12 year old son are non-swimmers and never done kayaking before. But Claire and her team made us so comfortable that we never felt afraid and were able to enjoy the stunning views. We took a morning trip, so the water was very still we could see some amazing reflections. The best part was, the crew took our photos and emailed them to us, so we got some wonderful photos (see below) without having to bother taking our cameras onto the water. And as a bonus, we got included in the pictures too. We were very lucky to see a rainbow on the water surface — a rare phenomenon called “light fire” I believe. Bronwyn at Glacier kayaks was very helpful and answered my endless questions on email very patiently and made sure our trip went off well. She organised the Heli Hike for me as well and got us a good deal on the combo (kayaking + helihike). Highly recommended….